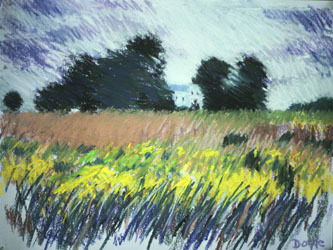 This is a reproduction of an original pastel, Pocopson Field. It is a scene from my area of rural Pennsylvania. I love the simple forms represented - a small round tree, larger group of tree forms, house, sky and simple fields. Fields in a painting produce fields of color - very satisfying to look at, restful, whether fields of tall grass or wildflowers. Pastel is used here in a more expressive way - you can see the individual strokes, and the strokes are slanted in various directions that move the eye around the image. This is a half-conscious thing when I am working in pastel, which is a faster, more spontaneous medium than oil. When doing work like this, it is more felt than thought.